Now that it's September, I can honestly say that I see change everywhere I look. Over the Labor Day weekend on my regular walks around our trails and the meadow, I noticed several trees that were already turning. I don't know why this makes me a bit sad, but it does every single year. As much as I like autumn and winter, I think about the beautiful landscape the way it is now and the way it will look like in the coming months. Being surrounded by lush foliage, shrubs and plants is undoubtedly a feast for the eyes, so when it all disappears and becomes a barren landscape, it gives me a sense of longing for spring's renewal. Where has the time gone? I feel as if events, birthdays and holidays are coming much too quickly, and yet there is still a lot to do. Having said that, my month was filled with a lot of wonderful recipes and ideas here on the blog. It always amazes me whenever I get a message from a reader thanking me for having written about a certain topic or having shared a recipe that was tried in their very own home with great success. That's one of the reasons I love writing about the things I create or the things I come across, because I never know when someone is going to connect with it. Making that connection with a reader is what it's all about. Checking to make sure the jam has thickened properly. I couldn't get enough of this delicious jam after I made it. Surprisingly easy to make after following David Lebovitz's recipe using cherries from my local farmers market, the jam went on everything for over a week. I enjoyed it spooned into yogurt, on top of buttered toast, sandwiched between a warm biscuit and of course in a peanut butter and jelly sandwich. I'm tempted to make some more with frozen cherries from the store just to recapture the essence of a good homemade jam. Hot biscuits straight from the oven. That cherry jam was perfect for a split & buttered biscuit. 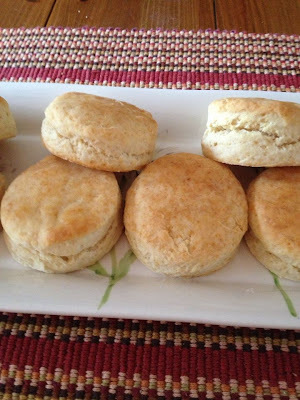 Light, flaky, buttery biscuits can be had at a moment's notice thanks to this heirloom recipe provided by my friend, Kenn. His grandmother's legendary biscuits were so delicious and so great to make, that several of my friends baked them within days of seeing the post. Buttermilk seems to make everything extra tasty, don't you think? Set on this wonderful platter over a woven table runner are freshly baked biscuits made by my friend, Darlene. I wanted to reach into the photo and grab one to have with my tea. Aren't they wonderful? 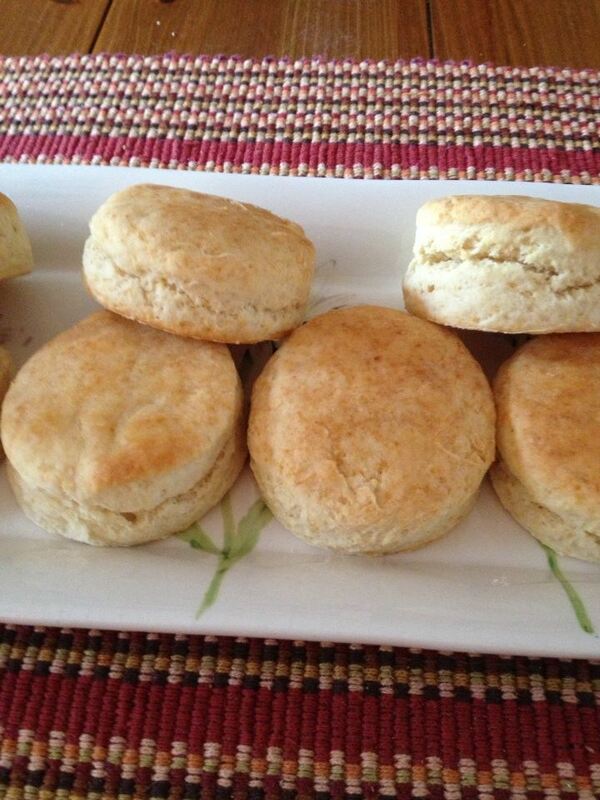 Make some biscuits this weekend! My favorite greengrocer market ever is The Reading Terminal in Center City Philadelphia. I never get tired of walking through the stalls of fresh vegetables, meats, cheeses, seafood and baked goods. For someone who loves to eat fresh and cook with the best ingredients possible, The Reading Terminal is the place to shop. What I tell anyone who goes to Philadelphia is to stop at this market even if it is just to take a look at what there is. If you happen to sample an item or two or more, then lucky you! I think I'm due for another visit in the coming days. Oh dear, these cookies went fast at my house. I baked them and before I knew it they were gone! Banana bread has always been a favorite thing of mine, but only when it's really flavorful and moist. I took those qualities and combined them with the best chocolate chips for an extraordinary cookie. Waste no time in making a batch because you probably already have the ingredients in your pantry. The only thing I recommend is that you use very ripe bananas and that you mash them with a fork for the best texture and flavor. Don't blame me if you find yourself nibbling more than one cookie. I had been meaning to do this post for over a year. Yes, that's right. I went back into my drafts archives and found the title of the post with no written material, so I knew it was time. After having gone antiquing in Haddonfield, the purchases I brought home that day were carried just like I showed in the post. It's my modus operandi whenever I go antiquing because it has served me well over the years. Take my lessons from this post and visit your local antique malls, shops and flea markets without any trepidation. I know many of you who do this already. What you must understand is that I very very rarely show you my living spaces here at home, because I take my privacy rather seriously. If you see a glimpse of something here and there I take extra care to show you only what I'm willing to share at the moment. I don't mean to aggravate anyone by this. My home office came about one day as I was organizing the mudroom. 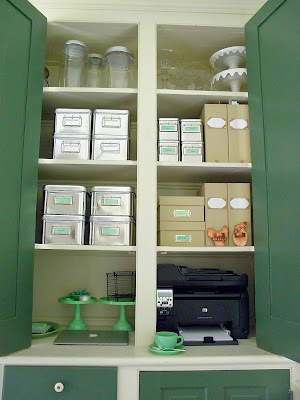 Here I had these fantastic cabinets which weren't holding anything and I thought to myself that an office could be housed there and none would be the wiser. It's amazing how quickly everything came together. Perhaps the best thing of all was that I was able to cover up that behemoth of a printer. I love working out of my new space. As a matter of fact, I'm writing from there right now. If you don't like blueberry muffins it's probably because you haven't tried a really good one. Forget about those from the supermarket or even worse, the gas station. Those sugar pucks are nothing more than a pale comparison to what a true muffin should be. Light, sweet and packed with lots of summertime flavor are the hallmarks of a good blueberry muffin. Another wonderful recipe to try if you haven't already. Trust me, these are not going to disappoint. One of a few homekeeping mistakes I don't care to repeat: using cold antique plates to serve hot food. A big oversight on my part that could have been avoided if I hadn't been rushed, and if I had paid closer attention to my plates. Some of you were shocked to find out that plates could even break with this kind of thermal shock, but it's true, they can. I do have a lot more ironstone and other dinnerware from the 19th century which doesn't get used as often, but when it does come out of storage you can bet that I prewarm everything. Treat your antique and vintage dinnerware with a bit of care so that you can enjoy it for generations to come. I almost felt like patting myself on the back for having used icing bottles for the first time. It's one of those things one realizes that makes this task a bit easier. I'm of the mindset that anything which enhances our time spent in the kitchen and makes us more productive is a very good thing indeed. Do you have icing bottles at home for royal icing? If so, you already know the pleasures of using them. Enjoy decorating those cookies! Some of the recipes and topics I covered this past month are so good that I wish I could go back and rediscover them all over again. Lucky for us, everything here is doable and approachable, not to mention tasty and scrumptious. As the Labor Day weekend comes to an end I do hope that all of you are enjoying the last bits of summer. Here is to lots of good things on the horizon. Expect them! Oh, David! You're so right... Time does fly by much too quickly! Although, I must say that while I'm usually not excited about how quickly the years pass, at this time while our son is deployed, I am praying for every moment to pass as quickly as they come! Your property and everything in it is beautiful - thank you for sharing so much of yourself and the wonderful recipes too! As you know, I made your chocolate chip/banana cookies and took them to our son to share with his battle buddies as they prepared to deploy - They were a HUGE hit. So thank you! You know that your family is in my thoughts & prayers, so I too hope that these next few months go by quickly for you. As for the "years passing by" for us, I know, it's difficult sometimes to come to grips with that. What's one to do? How AWESOME that they liked the Banana Chocolate Chip cookies at the base! Your son & his buddies rock!